I have always regarded the marriage vows as a confession of mutual mistrust—how much stronger and more binding would a relationship be that survived without them, whose bonds lay deep in the heart rather than on a scrap of paper and the mumbling of a priest. It is because people cannot bring themselves to trust one another that their good faith must be circumscribed with a legal agreement. 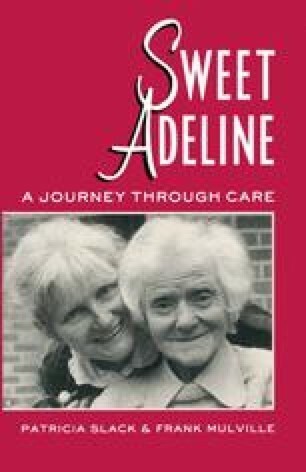 All the same, I understood clearly that I would never sell this opinion to Adeline, or to Wendy’s relations in Ireland or to the good folk who lived near Adeline, or even to Wendy herself. Wendy needed a commitment and needed help and support as I did myself. Without the help, from whatever quarter it might have come, I do not believe she could have carried through what she had embarked on. I was not myself a good advertisement for the institution of marriage, having already failed at the business twice, and therefore I was surprised, when I offered the contract to Wendy, that she accepted it. Neither of us has regretted it. Marriage for us has been tremendous fun and at the same time it made our lives easier in many respects. Adeline was delighted.